Cast: Kirk Douglas, Jan Sterling, Robert Arthur, Porter Hall, Frank Cady, Richard Benedict. In the 1940s the screenwriting partnership of Charles Brackett and Billy Wilder yielded hit after hit for Paramount. Then in 1950 as Sunset Boulevard opened and Oscar nominations looked certain, Wilder announced that he wanted to call the partnership quits. 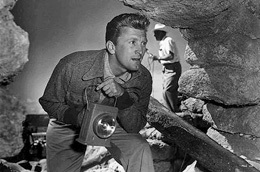 Ace in the Hole was to be Wilder’s attempt to make a personal film. It remains an extraordinary movie to emerge from a major studio during the period. The conceit which young radio writer Walter Newman presented Wilder was not original, evoking a 1925 Kentucky cave-in that was front-page news for weeks. Ex-newspaperman Wilder was taken with the possibilities. Chuck Tatum (Kirk Douglas), a down-at-heel newspaperman from New York, rolls into Albuquerque. Some time later a man is accidentally buried alive in a nearby Indian cave dwelling. Deliberately keeping him buried, the newspaperman builds up the story until all America rolls up. Boosting circulation and creating a national sensation, the story puts Tatum back on top. Then Leo Minosa (Richard Benedict) dies. Remorseful, Tatum tells the crowd to go home. The story resonates down the years. So confident was this personal statement that there was even talk of replacing Paramount’s mountain with a coiled rattlesnake girthed in stars. The studio not only baulked, but sent press agents to every city desk in America to persuade editors that Paramount didn’t believe all journalists to be as crass as Tatum. Far from the boudoir innuendoes of 1930s Brackett-Wilder collaborations, Ace in the Hole was symptomatic of a taste for brutal modernity manifest in Wilder’s work since before even Double Indemnity (1944). Embodied in Tatum is the ruthless ambition of a society heading for international hegemony as it broke the back of what it had gladly dubbed the ‘American Century.’ By 1950 the suburban American population had grown to 20,872,000, while New York had overtaken London as the world’s leading financial centre. (3) Leaving the soporific crowd in his dust, the pugnacious Tatum evokes New York at a particularly triumphant post-war moment. There is scarcely a shot in the film which doesn’t feature Tatum, and in one of the boldest in any Wilder film, Lang sets up a low angle as the bleeding, defeated journalist collapses at the feet of his editor. Whilst Ace in the Hole won an award at the Venice Film Festival, it flopped so badly at the American box office that a chastened Wilder went on to mainly adapt hit Broadway plays until 1960. Most Americans either hated the film or stayed away. Reviewers savaged it in turn. In 1997, the film was remade as Mad City (Costa-Gavras). If the title ‘Mad City’ carries a hint that this city is exceptional, it also reminds us that Ace in the Hole‘s title was changed to The Big Carnival, according to the industry convention that ‘Big’ suggested exceptionally immoral doings. Oddly, the studios are still dependent upon yet scared of an unpredictable crowd. And with good reason, perhaps. As Wilder once said, people are people, after all. Fifty years on, some still pause at highway pile-ups…. Neil Sinyard and Adrian Turner, Journey Down Sunset Boulevard: The Films of Billy Wilder (Ryde, IOW: BCW Publishing, 1979) 136. Quoted by Ed Sikov in On Sunset Boulevard: The Life and Times of Billy Wilder (New York: Hyperion, 1998) 322. Quoted by William L. O’Neill in American High: The Years of Confidence 1945-60 (New York: The Free Press, 1986) 19.